Do you think that a man who has killed someone ought to be archbishop? That question troubled England. 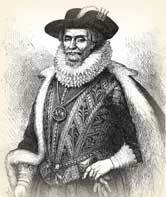 George Abbot, was a prominent translator of the King James Bible and became archbishop of Canterbury. He was also guilty of manslaughter. Abbot was born on this day, October 19, 1562 in Guildford, England. His Protestant parents suffered persecution during the reign of the Catholic Queen Mary. Their boy grew into a Calvinist and Puritan. When he was fourteen, he went to Oxford University where he became a popular preacher. Twenty-one years later, he was master of University College. When King James I agreed to a new translation of the Bible, Abbot was appointed to the team responsible for the gospels, Acts and Revelation. Beginning in 1609, James rewarded him with rapid promotions. He had made himself useful to the king, persuading Scotland to adopt a modified episcopal arrangement for its churches. In less than two years, Abbot became Archbishop of Canterbury. Critics said he was made "a shepherd of shepherds before he had been a shepherd of sheep." Yet Abbot was no toady to the crown. He opposed James when necessary. When the king pushed for sports laws that would have defiled Sunday, Abbot firmly resisted. He spoke out against a scheme to marry Prince Charles to the infanta of Spain. In spite of his opposition, James always liked him and had him at his bedside when he was dying. On his doctor's orders, Abbot hunted as a form of exercise. In 1621, the same year that he founded a hospital at his own expense in Guildford, he killed a man. He was hunting and his arrow glanced off a tree. Enemies, led by William Laud, who would later lose his head for cruelty, said Abbot should no longer serve as archbishop: he was a man of blood. James appointed a commission to decide the question, but they were evenly divided. The king ruled in Abbot's favor. Abbot never overcame his sorrow and shame. He seems not to have learned to cast his care on Christ. To the end of his life, he kept regular fasts for the accident and he made the best amends he could to the man's widow. But he could not live the incident down. Once he grumbled when a group of women gathered around his coach to stare at him. He was cut to the heart when one of them taunted him that perhaps he should shoot at them, too. "Abbot, George." Dictionary of National Biography. Edited by Leslie Stephen and Sidney Lee. London: Oxford University Press, 1921 - 1996. "Abbot, George." The Oxford Dictionary of the Christian Church. Edited by F. L. Cross and E. A. Livingstone. Oxford, 1997. Hook, Walter Farquhar, 1798-1875. Lives of the Archbishops of Canterbury. London, R. Bentley, 1865 - 1884. Young. Concise History of the Netherlands. Boston: Estes and Lauriat, 1884. Source of the image.